Double EPs for Sophia Squire on VP Record label are out now! 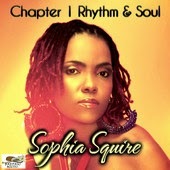 The package was released in two chapters where Chapter 1 Rhythm and Soul is a 4 track EP featuring some of Sophia's love songs such as Secret Lovers, For Awhile, Slow Motion and Thing Called Love. Chapter 2 Roots Rock Reggae is a 5 track EP featuring a variety of songs such as Nature's Calling, Nah Fight Ova Man, Rat-A-Tat-A-Tat and Nuh Gunz. Manager Audley Allen said the artiste fully endorse the move to package some of her 'most popular songs' to appease fans who have been asking for an album which according to him, 'is in it's preliminary stages."